Methane (CH4) is 25 times more efficient at entrapping solar radiation and effectuating global warming than is carbon dioxide (CO2). As the Arctic becomes more and more ice-free, the release of methane entrapped for millennia in Arctic ice accelerates. This, in turn, increases the risks of a planetary catastrophe. Yet, the scientific community does not like using words like “catastrophe,” which is considered alarmist. So, forewarned, this is an alarmist article. Not only is this article alarmist, it is an indictment of views about climate change held by most, if not all, of the Republican candidates for presidency. Regardless of their individual personal beliefs about climate change, they are beholden to fossil fuel interests and extremely rich right-wing whackos that clandestinely pour money into phony orgs and payoffs for weak-kneed, cowering scientists to disseminate “confusing information to the public about global warming/climate change.” Without a doubt, these are the nation’s top gun eco terrorists. Similar to Al Qaeda, they work in the shadows. Over the past couple of centuries, the rate of increase of CO2 versus CH4 in the atmosphere is running askew as carbon dioxide’s increase of 40% is a far distant second place to methane’s 250% increase. There’s nothing confusing about those numbers. As it happens, by all accounts, climate scientists are wringing their hands over the 40% increase in carbon dioxide. That’s understandable as CO2 remains in the atmosphere for up to hundreds of years, blocking solar radiation from bouncing back into outer space. Ergo, over time global warming consumes the planet in a dreadful event that is currently tracking headlong towards bright red flashing lights at the end of the tunnel of doom. Thereby, CO2 blanketing the earth is similar to turning on an oven, the more CO2 is emitted, similar to turning up the oven, the more heat builds, as it gets hotter and hotter and hotter over time whilst the “CO2 blanket” traps solar radiation. In time, humanity is toast. Considering the fact that scientists worry about CO2 in the atmosphere, they must be experiencing migraines, sleeplessness and outright gloominess about CH4 because, with gigatons of methane trapped under Arctic ice, only a fraction of that CH4 could turn the planet into something akin to an oven, assuming too much Arctic ice melts. And, that is precisely the point as Arctic melt is already occurring at an alarming rate! It’s all about runaway global warming as the Arctic threatens to turn ice-free in September, during its minimal cycle, in an upcoming year. Some Arctic experts believe it could happen within a few years, some several years, some in decades or longer. There is a lot of mystery behind the likely impact of an ice-free Arctic because it has never happened before in human history. Questions arise: How much methane is trapped under the ice and how quickly does it release into the atmosphere and how soon does agricultural land turn bad? Of course, the process takes considerable time to play out because nature still follows a geological time clock, which is very slow. Nevertheless, human-induced climate change has already proven to speed up nature’s course, increasing the risks of a runaway global warming nightmare, maybe within current lifetimes, who knows? After all, the proof is found in facts. As a result of excessive levels of greenhouse gases like CO2 in the atmosphere, the Arctic is warming up 2-3 times faster than lower latitudes, which fact shall be discussed further on. Still, nobody knows how this will play out. After all, how many scrapes with extinction has humanity experienced? The answer is: None, this will be the first go-around. “It appears that the rise of methane in the atmosphere is accelerating… Things look set to get worse… global methane levels have risen from a low of 723 ppb a couple of centuries ago to mean methane levels as high as 1,839 ppb in 2014. That’s a rise of more than 254%. The situation is dire….” (Source: Methane Levels As High As 2,845 ppb, Arctic News.org, April 26, 2015). Not only that, unruly spikes of methane up to 2,845 ppb are becoming more commonplace in the Arctic. 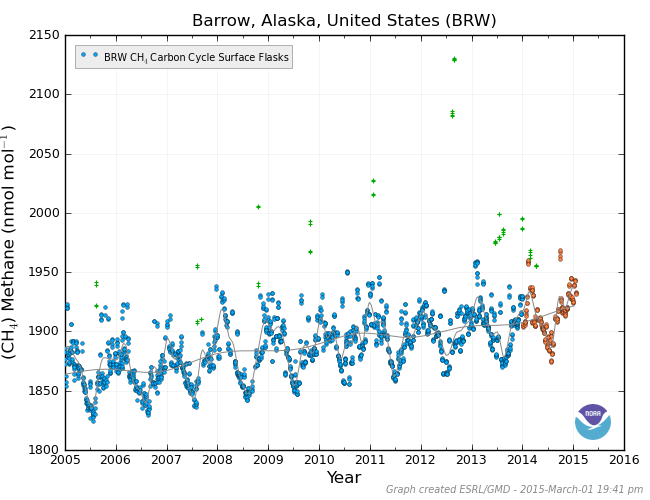 Meanwhile, the Arctic’s big spring melt down is now in full swing, according to the National Snow & Ice Data Center (NSIDC), University of Colorado, Boulder, as of May 6th, 2015: “During April, the decline in ice extent starts to accelerate… April 2015 was marked by a fairly rapid decline during the first week of the month, little change during the middle of the month, and then a steep decline over the final week.” Uh-huh. Additionally, and of crucial interest: “April was marked by higher than average air temperatures (1 to 3 degrees Celsius or 2 to 5 degrees Fahrenheit) throughout the Arctic,” which is the evidence of Arctic temperature increasing 2-3 times faster than elsewhere on the planet, Ibid." According to Dr. Shakhova there is 50GT of CH4 ready to explosively release when there is insufficient ice left, very soon. Plus another 1000GTs in the oceans that is releasing now but will go explosive at a small temperature rise at deeper and deeper levels. 3.3 billion years ago the oceans boiled, but not completely, and life went on. Most do not think we will end up like a version of Venus, but the oceans could boil. It could just go to the way it was then, with life recovering and evolving after millions of years. Rocks left over from Earth’s adolescence suggest that giant impacts boiled the oceans billions of years ago, lowering the global sea level by tens of meters. The huge amounts of energy released during the impacts increased air temperatures to more than 500° Celsius for weeks and above water’s boiling point for more than a year, researchers report online May 7 in Geology. These dramatic events would have shaped the evolution of early life on Earth, says geologist Donald Lowe of Stanford University." The entire accretion phase was also like hell on Earth. So it will be again, from human causes. The deepest hole ever drilled was about 8 miles, stopped by underground temperatures nearing 300*C, and it took 20 years or so to drill. The fact that the bottom of Yellowstone's upper magma chamber is about 12 miles, and the large lower one at 25 miles, and the temperatures involved, make 'blowing Yellowstone' impossible for humans. It is due to super erupt in 2K to 30K years, far too late to stop or even mitigate runaway CAGW. If an event crashed the population to 5% within a decade, the survivors would still have to endure disastrous heat effects, even if warming is kept to around 1 3/4*C world average(which is zero emissions within a few years). That is still not a guarantee because open ocean warming is in runaway and will set off the tundra clathrate 'bomb' as early as the mid to late 2020s without some massive intervention or change. Shutting off the fossil fuel supply would immediately crash the population, but who will shut off the valves of wealth and power driven by greed? No one wants to die, but humanity must die off before totally destroying the future. A giant meteor or comet strike is not really due for 13 millions years, but smaller ones could trigger collapse and a much lower emissions profile. Again with a time limit on it actually stopping the methane and CO2/H2O turnover process toward a different atmosphere and too much heat for too long for life. The only thing to work will be the Power of God, if He so desires to save Earth's biosphere. People will not lower emissions enough in time or die off in time to stop the runaway to runaways. If people crash soon enough, then there is a chance the biosphere may recover in a lot of time. Like in the scenario in the above article, thermal vent life could seed further life if the oceans only partially boil away and after many millions of years, advanced land life forms again. However there could be as much as 5000GT of CH4 in dubious sequestration, and that is enough for the 'Venus Effect'. Odds are long on the planet pinning down temperatures below a 1.5C rise on pre-industrial levels by the end of the century. While 100 nations – including those menaced by rising sea levels and droughts – support the lower bound of an internationally agreed aim, most are sceptical it will be met. Even getting off the planet’s 4-5C warming trajectory to stay within 2C will be a Herculean task. But the world hasn’t shot it just yet, according to a report published on Thursday; 1.5C remains “feasible”, albeit with radical conditions. Writing in the journal Nature Climate Change, German and Austrian researchers urge immediate curbs on greenhouse gas emissions and placing faith in carbon-stripping technology. It’s a call to negotiators crafting a global pact to keep under consideration a lower goal, reducing the severity of climate impacts like sea level rise, droughts and heat waves. Though they set out the “substantial” obstacles in the way as countries wean themselves off fossil fuel-driven development. “Actions for returning global warming below 1.5C by 2100 are in many ways similar to those limiting warming to below 2C,” said Joeri Rogelj at the Vienna-based International Institute for Applied Systems Analysis, and a lead author of the report. “However, the more ambitious 1.5C goal leaves no space to further delay global mitigation action and emission reductions needs to scale up swiftly in the next decades,” Rogelj added. I know from my geological studies that 1.5*C in the past did not set off a thermal max event. However, with the .8*C rise and the .7*C in 'momentum', we are at that limit now. Although there is less methane as you go further into the past, so it is possible, that reduction to zero of HGHGs would still not stop runaway. "Though not being communicated, the alarming data above for 30 May 2015, looks like the state of the climate is set up for feedback runaway global climate. ​​From the very start the big concern about global warming has been the possibility of a 'runaway' global warming and climate change. This is the greatest single danger to the survival of humanity and also the survival of potentially almost all life on the planet. ​​A global heating runaway wiping almost most life we know is possible- because it happened 250 million years ago in the End Permian extinction event and 55 million years ago with the Paleocene-Eocene thermal maximum (PETM). Current research confirms both of these extinction events were driven by very large emissions of carbon to the atmosphere. ​​The PETM is the closest distant past analog to our GHG emissions global warming situation today. Research published October 2013 by Morgan Schaller and James Wright leads to their definite finding that following a doubling in carbon dioxide levels, the surface of the ocean turned acidic over a period of weeks or months and global temperatures rose by 5 degrees centigrade – all in the space of about 13 years. Scientists had previously thought this process happened over 10,000 years." "Right now we are in a runaway situation, meaning we are committing ourselves and all life to a rapid accelerating global heating that we could not possibly change. James Hansen has been warming about this for many years. Runaway is largely about methane- especially the enormous stores of Arctic carbon as methane emitters. Carbon dioxide and nitrous oxide feedback GHG sources are also huge. In runaway all three would be self reinforcing and accelerating. Methane has a global warming effect of 72X CO2 for 20 years after emissions." I hate to agree with you, but I do. Yet, even though the game is most likely over, ..... I don't think I would agree with you as to "why" it is over. Nobody in their right minds can look to America as an example (for so many reasons). But beyond this fact, and since the entire house is burning down, why look to just one room of the house? It is essential that we begin to not only see, but also talk about our situation in global terms. If you want to talk about examples, you might look to Northern European countries. I might have, at one time, suggested Canada, but I wouldn't anymore, since Harper has taken to muzzling scientists in favor of corporations. Extreme overpopulation in the USA, China, and India, is most responsible for HGHGs, but the rest put out a lot, also. Only hope gives the illusion that the needed reductions can be done in time. While most want to do that by 2050 or 2030, but that is far too late. Rapid depopulation of humans is really the only way to cut emissions enough. How will that happen in 8 years? A nuclear war with ground blast aerosols? Cascadia, La Palma, Katla, or economic crash inducing an early population crash? A miracle from God? All are possibilities. Otherwise, it is the beginning of the end of this biosphere. The rocky planet will still be here with no biosphere, hidden by clouds, until absorbed by the red giant phase of our Sun. Professor Wadhams claims climate change research must, front and center, become the major thrust of a worldwide scientific effort, and it must be done urgently, similar to the Manhattan Project (ironically.) Society will be forced to use some technology, which is not yet proven, to remove CO2 to prevent a catastrophe. Accordingly, there is no time to tinker around. Also, on July 1, 2015, a temperature of 36°C (96.8°F) was recorded near the Kolyma River that flows into the East Siberian Sea. The Arctic is hotter than Miami!" "Really in the soup"? Precursor to the human (over)population crash? Too late to stop the methane monster without massive CO2 scrubbing of the Earth's atmosphere. We are in runaway, obviously. Plus, ahead in a decade is the start of mass death on a global scale, and including other species. Then we have all the other stuff like devalued dollar, Cascadia, La Palma, and Katla volcano, also in the picture to help crash the human population. I have nothing against Hunziker and maybe he is on to something but he is an economist not a scientist. When I see a lot of scientists who are expert in the field and/or the IPCC start worrying about a methane runaway then I will take it seriously. As of now I see it as an incremental problem like CO2, with no sudden blast of methane waiting to take us into instant runaway mode. Here you can see a graph showing the actual increase in methane. It definitely is contributing to global warming but the rise is slow and steady and I suspect will continue in that fashion as long as we remain addicted to fossil fuel. The Hawaiian measurements are not close to the Arctic's. The field scientists in the Arctic are the ones most worried. The fact that an economist predicts doom and gloom does not impress me. I've read up on the subject of methane, principally from Real Climate, the site of choice for climate scientists and they doubt the sudden catastrophic release scenario. It doesn't mean it won't happen, just that most of the folks with scientific credentials find that the evidence for that scenario is presently quite weak. Want methane in the arctic? How about Barrow Alaska. I totally support studies on possible catastrophic scenarios for sudden massive release of methane. It just doesn't seem responsible to run around making catastrophic predictions without hard evidence. The IPCC in a FAQ pdf addresses the runaway warming issue. Their prediction is no, not certainly within any near term period. Go to FAQ 6.1. Their will be and is methane and CO2 feedback from tundra and underwater sources but not of an extreme variety. ocean regions and bottom sediments will take still longer—between centuries and millennia to warm enough to destabilise the hydrates within them.